Writing a complex novel is like juggling: You've got to keep all the balls in motion, and you've got to make sure you don't drop any -- especially when you've got an audience.Reading The Mammoth Cheese was a lot like watching an expert juggler. In this solid, contemporary novel, author Sheri Holman masterfully juggles three distinct storylines, each with its own weight, size, shape and gravity. In the first, the rural town of Three Chimneys, Virginia, is catapulted into the international limelight when Manda Frank gives birth to an unprecedented 11 babies. Everyone from politicians to the media to the ministry wants a piece of "The Frank Eleven" fame. 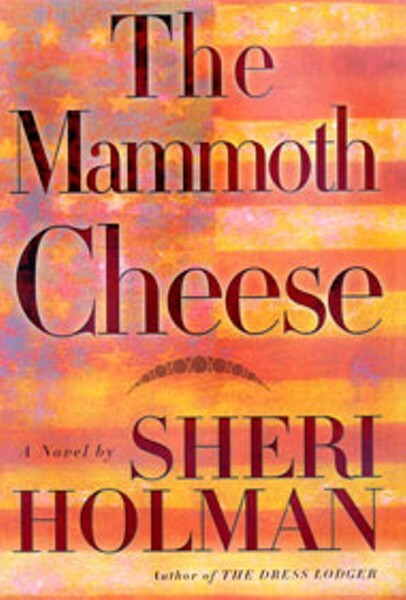 The second storyline revolves around artisanal cheesemaker and single parent Margaret Prickett, who faces foreclosure on her family's dairy farm after her husband leaves. Farmhand August Vaughn has worked for years at Margaret's side, but has hidden his desire for his employer beneath his intellectual ardor for the life of Thomas Jefferson. Third, Margaret's daughter Polly is growing into young womanhood in this fecund setting, an eyewitness to the visceral cycles of birth, life and death. She's asserting her rebellious independence in ways that will test the boundaries of propriety. Subplots about a politician, a teacher and a minister -- egotists all -- personify Holman's exploration of that pervasive human quality known as hubris. When the media lose interest in The Frank Eleven, the townspeople devise a way to recapture their place in the public eye. They re-enact a peculiar historical event, one in which dairy farmers crafted a 1,235-pound handmade cheese, then carted, hauled and boated it to Washington, where they presented it to an eloquent President Thomas Jefferson. "In 1800, Jefferson had won the most closely contested election in American history....[it] had been dirty, and cruel, and violent, yet Jefferson considered it a triumph of democracy, a second American Revolution, for power had changed hands without bloodshed or rebellion, and the infant American experiment, which he'd feared might be stillborn, seemed destined to thrive." Like Holman's other novels, the acclaimed A Stolen Tongue and The Dress Lodger, this is an ambitious creation from an inventive mind. One of Holman's gifts is the ability to bring to life the small details and social underpinnings of human behavior so realistically that it seems almost effortless. Like Barbara Kingsolver, Holman can convey a cautionary message without preaching. And while her alternating storylines may seem at first to be incongruous, Holman never loses her narrative grip, but tightens it inexorably as the book moves smoothly toward its conclusion. Only one element in this thoughtfully constructed story seems unlikely. It's unclear exactly why a woman in her 20s, already having given birth without medical intervention, would be taking fertility drugs. But if this is an exaggeration, it works in service to the story as an apt illustration of our society's fascination with -- and frequent voyeurism toward -- the phenomenon of multiple births and the celebrity that often follows. There's something oddly intriguing about the cheese itself, too. This ubiquitous food product, so much a staple of modern American diets, nearly takes on a life of its own as Margaret coaxes it into being: "If it had been a wounded patriot supine on the battlefield, Margaret could not have nursed it more tenderly. . .marveling at the innate properties of milk that allowed it to move from fluid to solid, from something that might spoil in a matter of hours to something that would keep for years." What will happen once the colossal cheese and its creators reach the president? Will the newly elected leader make good on his campaign promises to provide relief for struggling farmers? Will Washington respond with gratitude, with opportunism, or with post-9/11 suspicion? At its organic heart, The Mammoth Cheese speaks to our individual and collective senses of belonging, obligation and freedom. And it's these challenges that all of us -- as patriots, dissenters, and citizens -- must ultimately juggle and balance for ourselves. Amy Rogers is a founding editor of Novello Festival Press, and the author of the forthcoming book, Hungry for Home: Stories of Food from Across the Carolinas.